Personal city cars are needed to counteract the traffic problems in major cities, and the example of Bangkok needs no further description, its traffic jams are now legendary. Volkswagen presented their future personal transport for city-dwellers at this month’s Frankfurt motor show where it unveiled the futuristic single-seater NILS concept. The NILS is miniscule. 3040 mm long, 1390 mm wide and 1200 mm high, and has one-seat. BMW has its own all-electric hybrid i3 city hatch that will enter production in 2013 and other city cars in Frankfurt are Audi’s two-seater open-wheeled Urban Concept and the Smart Forvision EV from Daimler. 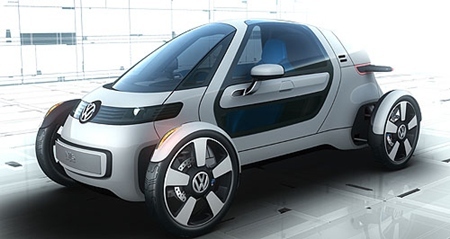 VW says the one-seat NILS features an aluminium space-frame chassis that helps bring the weight to just 460 kg but meets all current safety requirements. The one seat configuration was chosen because almost 90 percent of German city commuters travel without any passengers. The NILS is powered by a 15 kW electric motor that produces up to 25 kW/130 Nm in short bursts to the rear wheels and is powered by a “relatively inexpensive” 5.3 kWh lithium-ion battery pack, which only takes two hours to fully recharge, so can be done during working hours at the office. VW also says their statistics show around 70 percent of all commuters residing between Berlin and Munich cover less than 25 km on their way to work. The NILS has a driving range of up to 65 km, depending on driving style, has a top speed of 130 km/h so it can travel on the autobahns and it is claimed it can accelerate to 100 km/h in a respectable 11 seconds. Supported by the German transport ministry, the NILS project is “designed to be both technically realistic and economically supportable”. Volkswagen’s head of development Dr Ulrich Hackenberg said NILS anticipated the future. “The goal of the NILS project is to research a technically concrete and economically feasible vehicle concept for micro-mobility which restructures individual transportation to make it more efficient and environmentally compatible based on electric drive technology,” he said. Next articleAn F1 race – here? What would you pay for an old Harley?